Over the past year, ICTJ has worked with victims of the Ivorian crisis to promote their collective agency and ensure that reparations measures formulated by the government address the various harms they have suffered. Indeed, for reparations to have meaning, they must recognize victims’ agency and respond to their specific needs. On May 20, ICTJ held a high-level conference in Abidjan, in cooperation with the National Commission for Reconciliation and Compensation for Victims (CONARIV), to provide victims with a platform to present their policy recommendations on reparations to policymakers, local civil society and international partners. Victims’ representatives made concrete proposals, described the harms they had experienced and detailed the consequences suffered by victims. They asked for specific forms of redress that often included those who suffered directly and their family members. Their presentations illustrated the magnitude of the harms suffered and underscored the importance of effectively and quickly implementing reparations. For example, in consultations leading up to the conference, the victims’ representatives presented the different consequences that sexual violence may have on women and their families beyond the direct experience of aggression, including isolation from being abandoned by their husbands and having to find ways to support their children on their own. They proposed psychological counseling for the woman and her children; adequate and accessible medical care; monetary compensation; and possible scholarships for the children as appropriate forms of reparation in such cases. In March 2015, the Ivorian government took a significant step forward in addressing past harms by establishing CONARIV. CONARIV is responsible for producing a single list of victims and proposing reparations measures for their benefit. While CONARIV’s creation represents a significant opportunity, for it to truly succeed, it must actively engage with victims in the development and implementation of individual and collective reparations measures in a meaningful way. One main concern is how to ensure that victims—or a representative sample—participate in the process. Such a sample needs to include organizations of affected and marginalized areas, rather than just human rights NGOs based in the capital city. ICTJ developed a mapping process of organizations located in areas affected during different periods of the crisis: Bouaké, the second largest city of the country; Duékoué and Bangolo, in the west; and Abobo and Yopougon, two major neighborhoods of Abidjan. For CONARIV to succeed, it must actively engage with victims in the development and implementation of individual and collective reparations. Representatives of 225 organizations from these areas participated in a series of consultations facilitated by ICTJ over a period of several months. These discussions helped to identify the most serious violations; the current consequences and obstacles that affect victims; local methods that would be useful in improving victims’ lives at the community level; and the formulation of recommendations to address them. 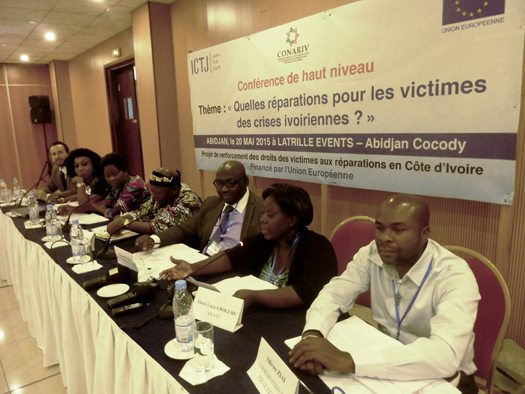 These initiatives culminated in the participation of a total of 50 victim representatives at ICTJ’s high-level conference in Abidjan on May 20. Special emphasis was placed on recognizing women victims’ voices throughout this process. During consultations, special sessions were held for women victims to define reparations measures that are both capable of overcoming obstacles women commonly face and are designed in ways to render them accessible. The high-level conference in Abidjan was a chance to bring the ideas and voices of victims to policy makers and practitioners. The goal of the day’s activities was to include a wide variety of victims’ perspectives in proposals for the development of an official reparations policy. More than 100 people attended the conference, and the discussions generated ideas that may allow for a transparent process for defining such policy. Indeed, victims’ ownership of the process was a central focus of the discussions. Representatives made it clear that certain categories of victims should be prioritized, beginning with victims who were killed or disappeared, victims of sexual violence, and victims of physical harm including torture and those left disabled. Property damages or loss, though important, were considered as a second priority. Victim’s representatives also suggested ways in which their proposed measures could be implemented by pointing out which areas lacked certain kinds of doctors, appropriate facilities for counseling or social centers. The president of CONARIV, Monsignor Paul Siméon Ahouana, attended the conference and emphasized the importance of the centrality of victims in the reparations process—a message which was reiterated by the other commissioners. According to Mohamed Suma, Head of ICTJ’s Cote d’Ivoire Program, the dialogue between victims’ representatives and CONARIV was a considerable achievement. Following months of preparation, it was clear that victims’ representatives were better prepared to make policy proposals and to identify effective mechanisms for their delivery.